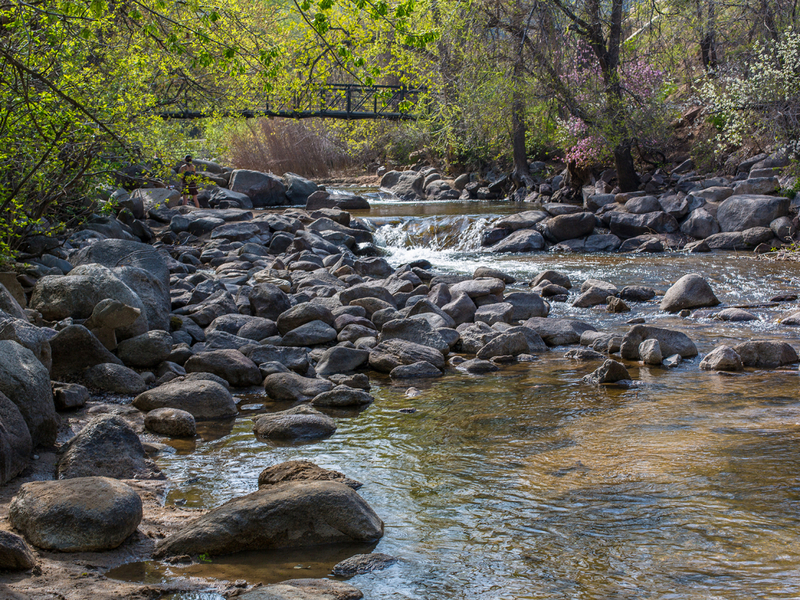 Boulder Creek features a fun whitewater course at Eben G. Fine Park, which is right in the heart of downtown Boulder. Bring your boat and paddle and have fun playing in the pools! The majority of Boulder Creek isn’t well suited for recreational kayaking. From Barker Dam in Nederland, there are a few expert sections that can be run (at grade IV/V), but the fast, shallow, rocky river doesn’t lend itself to quality paddling. However, once the creek gets into Boulder city limits at Ebern. G Fine Park, there’s an excellent play park for kayaking. Beginning and intermediate paddlers can enjoy a fun ½ mile slalom course with purpose built obstacles and a few exciting drops and slides. And because it’s not long, it’s easy to get in a few laps (or cruise on down another mile or so and take out anywhere along the creek -- the Boulder Creek Path parallels the river). The playpark is literally downtown, right in the heart of Boulder. It’s easy to access, fun to goof around in a sport boat and the obstacles are great for those looking to improve their skills. With minimum time investment, it’s great for an afterwork paddle or just to keep your skills sharp. For newer kayakers, this is a great place to improve specific skills. Boulder doesn’t have a lot of access to recreational whitewater -- though it’s only about 35 minutes from Golden, a good place to get better -- so it’s nice to have a place to put in right in town. And for those who brave the upper part of Boulder Creek, their expert skills will earn them some bragging rights. New kayakers, those looking to improve their skills and let’s not forget how fun Boulder Creek is to tube! Eben G. Fine park is located about a mile from downtown Boulder on Arapahoe Avenue. Follow Arapahoe west past 4th street, where it will terminate at the park.